Create a custom list view. Create a custom list view chart. Edit and sort list views. Since users don’t need an admin to create list views for them, Maria’s going to go get some coffee, and we’ll step into the shoes of one of her coworkers, Erin Donaghue. Erin’s a new sales rep for Ursa Major Solar, focusing on channel customers in the United States. She wants to set up a custom list view so she can see only those types of accounts. Here we go. From the App Launcher, navigate to the Sales app and select the Accounts tab. From the list view controls ( ), select New. Name the list Channel Customers. Select All users can see this list view. So far, the list view is showing us all the accounts, regardless of their type or location. Also, the Filters panel is now available. Let’s set up some filters. First, Erin wants to see only channel customers. From the Field dropdown menu, select Type. For Value, select Customer - Channel, then click Done and Save. Great! The list has been pared down to only channel customers. But let’s say Erin not only wants to see channel customers, but also only those on the West coast. Add another filter where Billing State/Province equals WA,OR,CA. Wow, that filtered the list down to only a few items. But you get the idea. The new view appears in the list view dropdown list so you can access it later. You can collapse and expand the filter pane by clicking . You can change who can see the list view by clicking and selecting Sharing Settings. You’ve created a custom list view and added filters, but there’s even more you can do. Erin doesn’t want to see certain columns, and wants to add others. Let’s start there. From the list view controls ( ), select Select Fields to Display. 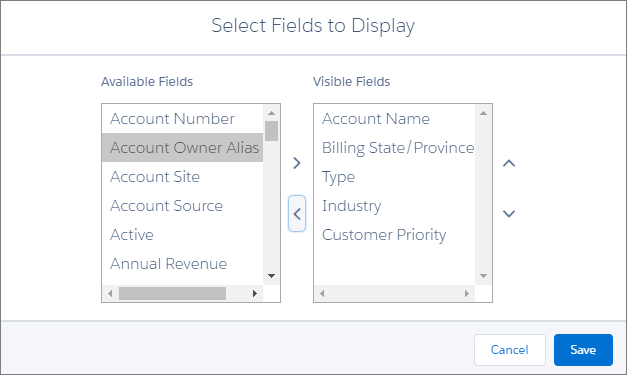 Move Account Site, Account Owner Alias, and Phone out of the Visible Fields area, and add Industry and Customer Priority instead. See the little arrow in the Account Name column header? That indicates which direction the contents of that column are sorted. Click the header to sort that column. The arrow indicates how the list is sorted: from the column’s first record ( ) (alphanumerically) or its last ( ). You can edit record fields directly from within a list view. Editable cells display a pencil icon ( ) when you hover over the cell, while non-editable cells display a lock icon ( ). List view charts help you visualize your list view data. 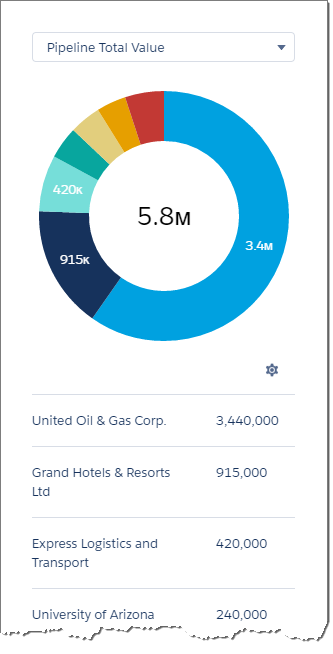 Erin wants to see which accounts represent the most overall pipeline value, so she’s going to add a chart to the All Opportunities list view. Let’s follow along. From the Sales app, click the Opportunities tab, and select the All Opportunities list view. In the Charts panel that appears, click and select New Chart. Name the chart Pipeline Total Value and give it these parameters. The aggregate type specifies how the field data is calculated: by sum, count, or average. The aggregate field specifies the type of data to calculate. The grouping field labels the chart segments. When you create a list view chart for an object, such as Opportunities or Leads, the chart is associated with the object. The chart is available for any list view that you have permission to see for that object, except the Recently Viewed list.